Half of the vines planted in the Bordeaux region, and the main varietal featuring in the Bordeaux blend, Cabernet Sauvignon is harvested late, issuitable for hot climates and thrives in calcareous soils. This strong varietal has supple, refined tannins, and sustained acidity. Cabernet Sauvignon forms the base of a reserve wine that benefits a long maturation, with only moderate grape production per plant, and harvesting of the grapes when they are ripened. This is the main varietal making up the Bordeaux blend as it gives hardiness, power and structure as well as longevity. The nose offers hints of ripe fruit as well as herbaceous pyrazine. Cabernet Sauvignon is blended with Merlot making it softer and velvety. Nebbiolo is a grape variety with a long history, which gives great results in the viticulture of the territory in which the pairing of the vine to its environment is adapted and tested in a kind of synergy. The vine is harvested late, with limited colour, but high tannin content mainly present in the grape seeds. The Nebbiolo plant must have a load content production and maturation must take place in late autumn. Adds elegance and finesse to the wine, as well as spicy notes. It's a variety from Bordeaux, of high sugar content, abundant colour and grape skin tannins. It gives the wine body, colour and a velvety texture. The maturation is always accentuated, it produces musts with limited acidity and hints of red fruit jam and ripe fruit. This varietal improves par excellence ("panacea for all ills", "cheese on macaroni"), essential to give an international flavour nod to the finished product. With the new Merlot plants we have expanded our acreage. Barbera is similar to Nebbiolo, with large harvests and strong acidity; it is more colorful than Nebbiolo, and the tannins easier to mature. It also needs to ripen late and settle. It gives to the wine an acidity, colour and red fruits. We use it to make the vintage wine " El Prim". Best defined as "cabernet franc" of the Friuli region. It's rarely grown in our area, but it was chosen because it gives personality and identity to the wines. A late and modest production rich in colour and polyphenols. Very suitable to varied climates and soils of high in limestone content. Wines gives structure and character with unmistakable notes of ripe red fruit and spices. Very suitable for ageing in oak. The Erbamat is an ancient vine, native to Brescia. Very late harvest, rich in acid components and therefore interesting for the production of a sparkling wine. 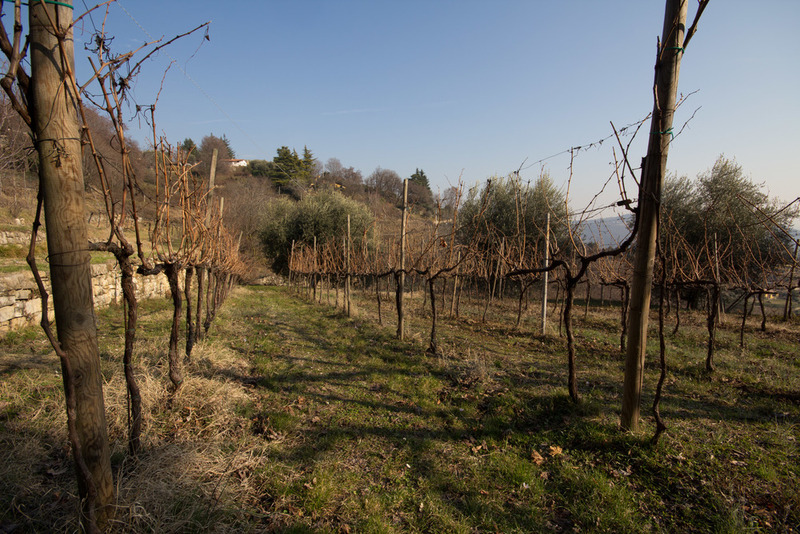 In recent years, Franciacorta has encountered many difficulties in the management of the maturation of the grapes for sparkling wines due to their precocity. Since the maturation of chardonnay and pinot noir, harvested in the heat of summer, important issues arise in relation to strategies to safeguard components of malic acid and tartaric acid. It's essential to try to move the vesting period and then harvest in the cooler months around September. Erbamat besides representing a specific identity wine could be used to change the platform of Franciacorta wine growing, in producing a sparkling base, and a unique wine. Erbaluce is a vine like Erbamat, grown for the production of still wines and sparkling wines similar to those in Caluso, Piedmont. Cultivable in Lombardy and therefore chosen to be compared with Erbamat. The etymology of the name tells something.